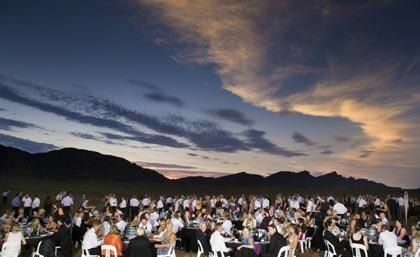 Every year the Royal Flying Doctor Service organises a special event at Wilpena Pound called Wilpena Under the Stars. On Saturday 19th February 2010 approximately 720 people from around Australia donned their finery and headed bush for the party. It was a wonderful experience in a spectacular location. The latest news from the RFDS is that the event raised over $80,000 this year. A great result for a very worthy cause. We were proud to be involved.